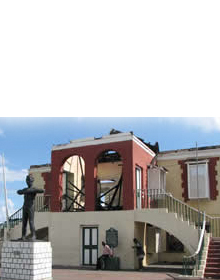 Fort Charlotte, located in Lucea, in the parish of Hanover, was built in the mid 18th Century by the British for the defence of the North North Westerly section of the island. It was built during the reign of King George III of England, and is named after his consort, Charlotte. The fort was built with a barrack capable of housing 50 men. 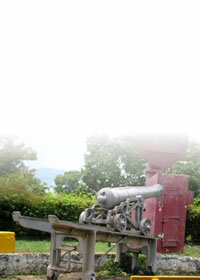 The fort had 23 embrasures for 23 guns, 20 of which were mounted. During the Napoleonic Wars it was thought that the guns at the fort were insufficient to guard the harbour, so in 1807, three 24 pounders on traversing carriages were installed on the seaward side of the fort. 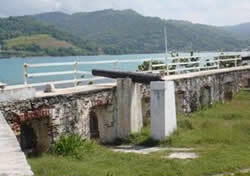 The fort is built of rectangular cut stone and has several openings toward the sea. Inside the fort is the remains of the circular base for the rotation of guns which were placed there so that they could shoot from every possible angle. The Artillery Store still stands and is made of cutstone. It has buttesses and a gable ended roof. 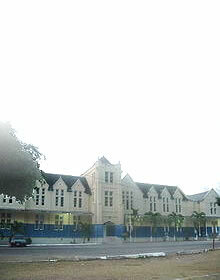 A section of the fort currently forms part of the Rusea's High School.